This painting is a study in contrasts of a variety of shapes, textures and colors. 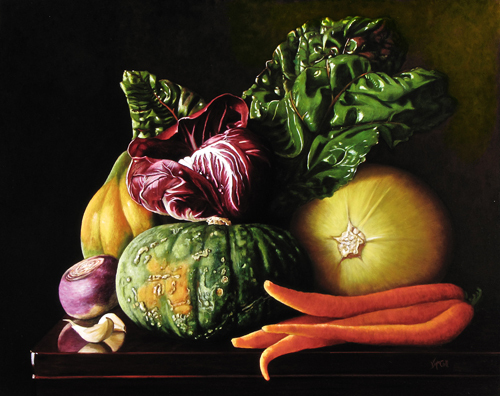 The actors in this table-top tableau are: the ivory-colored garlic cloves with papery outer layers, the smooth, dull-skinned acorn and spaghetti squashes, the larger green squash with its barnacle-like growths, the shiny and wrinkled chard leaves, the polished, reddish radicchio with flowing white lines, the long bright carrots and the quiet little turnip facing the light. The eye is led around the lower rounded shapes, then the focus is sent upward in the fountain-like arch of the chard and back down in the pouring-out motion of the radicchio veins to the downward curve of the carrot tip curling over the edge of the table. The compact piling of the vegetables creates a cornucopia-type image of abundance while the surrounding darkness and dramatic lighting amplify the serenity of this interior arrangement.